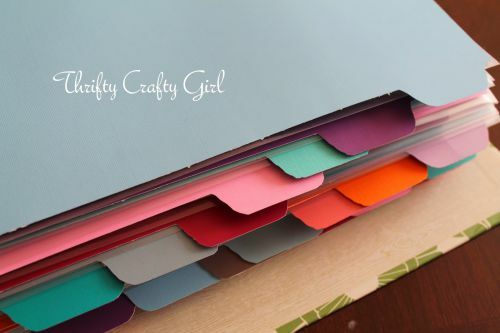 I am SO GIDDY to present our new Household & Organization contributor Priscilla from Thrifty Crafty Girl!! Priscilla’s blog is filled with tons of great ideas, and (unlike me) she excels in simple, easy ways to keep a great house! Don’t forget to stop by her blog and say hello, or visit her on Facebook, Twitter, Pinterest or Instagram!! Hi everyone! 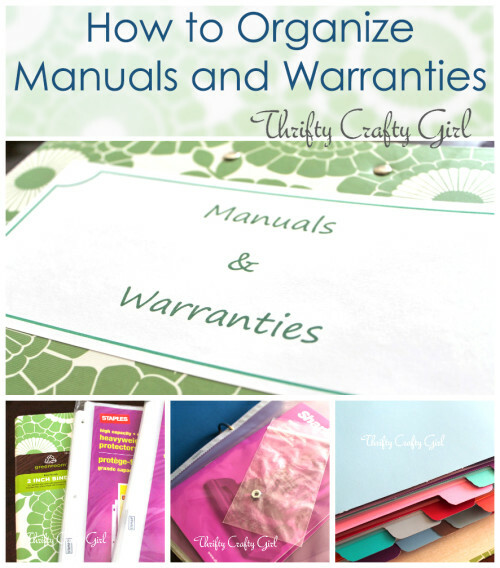 My name is Priscilla and I blog over at Thrifty Crafty Girl! I’m so happy to be here at Say Not Sweet Anne and I hope you like today’s post! Manuals are a thorn in my side. Honestly, every time I buy something, I dread taking that little manual out of the box because I can’t bear to throw it out and I hate having to find a place for it. And without fail, when I need that manual or the warranty, I can’t find it. I needed to get control of this whole thing. 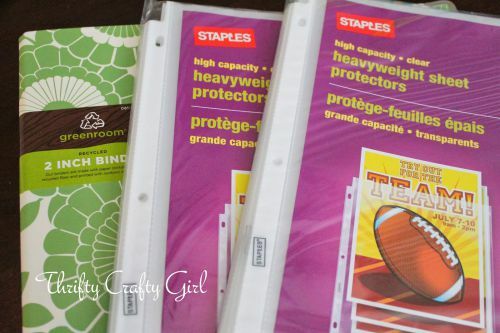 I bought a 2-inch binder and some heavy-duty sheet protectors. 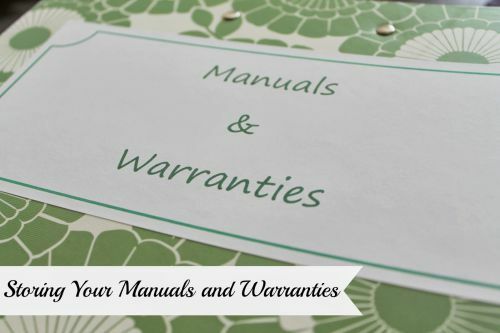 And then I rounded up every manual and warranty I could find around the house. I put them all in a sheet protector and put them in the binder. Quick and easy! And now, I never have to worry about losing another manual or warranty. I just love a good binder! My name is Priscilla and I am the Thrifty Crafty Girl! 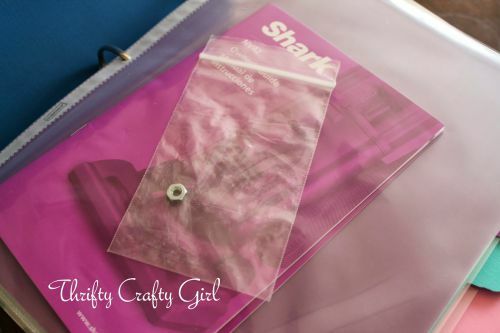 I hope to show you that living a frugal life is possible, even if you're a crafter like me. I started Thrifty Crafty Girl in 2011 to share my crafting and couponing tips and tricks while still keeping my sense of humor! I am a wife and mother of two children and each one of them try my patience every day... luckily, I have a great stockpile of Tylenol. I can be contacted at [email protected] I would love to hear from you! I have honestly never thought to use my Silhouette to cut out page dividers. THIS IS GENIUS! Now I need to find a bunch of things to organize so I can use a bunch of pretty paper!! I just bought a Silhouette and haven’t had time to try it out yet. 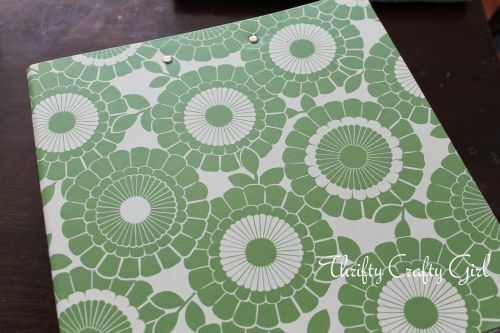 But cutting out page dividers sounds like a great idea! This is such a great idea! I hate my box of manuals, it’s so disorganized. Thanks for the inspiration. I really have no experience with the Big Shot or the Brother Scan N Cut. The Dividers shown were made using a purchased file for the Silhouette. It was as easy as buy, open cut! Perhaps there is something similar for your devices?